Oleamide is found naturally in all animals and helps to induce sleep. Scientists have found that oleamide helps to produce good REM sleep cycles, at higher doses. 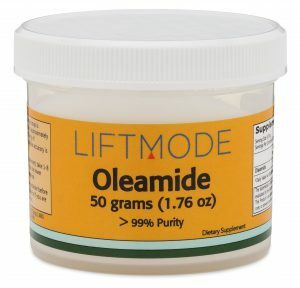 At lower doses, oleamide is a great calming and relaxing supplement. People often take oleamide to reduce stress and anxiety. At higher doses, oleamide begins to interact with your cannabinoid receptors, further improving mood and acting as a mildly psychoactive supplement. In this article, we’ll examine the best ways to take oleamide. We examine three of the top benefits of oleamide and take a look at oleamide side effects. Firstly, Oleamide is highly effective at promoting a calm, relaxed state. You can take oleamide to help with reducing stress, and induce a peaceful mindset. The great calming effects of oleamide are because of how it interacts with your brain’s GABA receptors. Oleamide also plays a role in your serotonin receptors, greatly improving your mood. Secondly, you can take oleamide to improve your sleeping patterns. Oleamide is made naturally in all animals to help with the process of falling asleep. When you’re lacking sleep, oleamide begins to occur in especially high concentrations. The exact mechanism by which oleamide aids in sleep is still under debate. It appears that the way it affects your GABA receptors has a lot to do with this. Finally, many people who take oleamide aren’t fully aware of how good it is for protecting their brain. A number of studies have shown that oleamide is highly effective at reducing ‘neuroinflammation’ – inflammation of your brain. Neuroinflammation is involved in many diseases including Alzheimer’s and dementia. Also, due to unhealthy diets and inactive lifestyles, many people suffer from chronic inflammation which is dangerous. Proper recommended dosages haven’t yet been determined for oleamide. However, most people tend to use oleamide doses of around 50 – 200 mg daily. Oleamide is a lipid, so it’s not soluble in water. One method to take oleamide is to just take the powder as is, under your tongue. Another possible method is to use empty capsules and fill them with well-measured oleamide powder, and then take one or two capsules prior to sleep. Finally, you could also dissolve oleamide into a high-fat substance like hot milk or butter, and add this to a cup of tea or hot chocolate. Or simply add some oleamide to a delicious healthy smoothie! Oleamide is best taken an hour or so before going to sleep. You can also use oleamide on a day when you’d like to just relax. So, hit up the couch and watch some movies or just chill on the beach all day! Oleamide Side Effects: Safety first! Again, the side effects of oleamide in humans haven’t been studied yet. However, this wonderful lipid is produced naturally by all animals in response to sleep signals. Over millions of years, your human brain and body have evolved complex and intricate mechanisms to remove excess oleamide before negative effects occur. Still, as with all dietary supplements, it is possible you may experience an allergy to oleamide. Oleamide is also known to make you slightly drowsy and may impair your motor functions at higher doses. It’s not recommended to drive or operate heavy machinery, especially on higher doses of oleamide. “Oleamide is interesting, in high doses, it’s relaxing and gave a [relaxed feeling]..., it also made me a little dizzy, but not in a bad way. In lower doses it gives you mild relaxation, helping somewhat with anxiety and tension. Since it's from olive oil I would assume it would also possess properties beneficial to overall health but I'm not sure as I could not find much information about Oleamide on its own. Oleamide can be taken under your tongue, in a capsule, or dissolved in a high-fat substance like milk, honey, or butter. You can also take oleamide powder in a healthy smoothie! The recommended dosage for oleamide is around 50 – 200 mg.